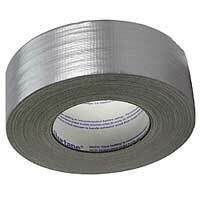 Gaffer - AKA Duct Tape But High Grade. Heavy fabric-based tape that rips cleanly in the direction of the weave. Used to tape just about anything. Shiny Finish. Please Note: We only stock 2" Black and Grey. All other colours and sizes are special order.